It's the real deal, this book fulfills the definition of "core" to perfection. First the only couple of "bad" things: 1) the monsters are missing, and that is surely due to the fact that it's already a huge book, so it's understandable. Besides, you can download "First Contact" for free and use those to start you off, or you can adapt Pathfinder monsters very easily with the guidelines provided in this book. 2) A few corrections were done to the part about starship combat, for which you will have to look-up the errata page online and mark down the modifications (mostly to DCs of actions in space). But to be honest, that doesn't bother me. Apart from that, this book does a fantastic job explaining the game and quickly teaching you how to play it with lots of examples and pre-made combinations of choices for characters to guide you, should you need it. They managed to cram so much in this book that it's in itself a notable feat, but more than that, every topic is presented with enough depth to not leave you wanting too much. The section on starships is both bold in scope and very welcome! The value for your money alone would warrant 5 stars, let alone the fantastic layout, illustration, narration and convincing world-building. Oh, I almost forgot about the game itself, how shall I put it... it's extraordinarily good! Exciting, fun, easy to play, sufficiently original without being weird, a bold start to a cosmic saga that continues the enormous lore of Pathfinder and opens it up to stellar proportions. My new favorite tabletop rpg! Been playing RPGs since 1977. Very excited to start playing StarFinder. Great value, 1 book is all a player needs, epic artwork, sturdy construction, the list goes on. Definitely a game produced by gamers, for gamers. I bought the physical book and then, for he first time in my life, the pdf version. If you’ve never bought a pdf before, I highly recommend it, EXCEPTIONAL value. Just to put it simply, this is an amazing game, the rules are an improvement over Pathfinder, but nos as simplistic as 5th edition. And the setting is just a great... we are having a blast playing the Dead Suns campaign. So far, it has become my favorite rpg! Starfinder is the latest roleplaying game offering from Paizo. But what is it really? Fans hoping for Spelljammer or fantasy Pathfinder in space with dwarves and elves will be highly disappointed. This is not the book for you. Honestly, you may be better served by looking at Starjammer (d20pfsrd) instead. So what is Starfinder? Let’s take a look. First off, Starfinder is much more of a hard-core science fiction game with some fantasy elements blended in. Character creation is much like any familiar process with the addition of themes, core aspects of a character’s background and motivations. In addition to reflecting a certain background, a theme provides benefits to an appropriate skill and ability scores. The races to choose from are all completely new except for human. Androids needs no explanation. Kasatha are a four-armed race from a distant desert world with a highly traditional culture. (Almost sounds like the Dark Sun Thri-Keen with the serial numbers filed off, doesn’t it?) Lashunta are a charismatic and telepathic race of scholars with 2 subspecies, one tall and lean, the other short and muscular. The Shirren are an insectoid race that broke away from a locustlike hive, community-minded but addicted to individual choice. The Vesk are a warlike reptilian race that recently declared a truce with the rest of the other races – for now. Lastly, you have the Ysoki, also known as the ratfolk, who are short, furry scavengers that make up for their short size with big personalities. Resolve Points are another new addition. Essentially, they are used to activate class features and regain resources. Some abilities require you to spend points but are active only as long as you leave a minimum number of points available to you. For example, an Envoy with at least 1 RP remaining in his pool can use her expertise class feature to roll an extra die on Sense Motive checks without spending the point. Resolve Points can also be used for regaining stamina points (I’ll talk about those in a minute), stabilizing and staying in the fight (healing 1hp to go from unconscious to conscious). Instead of sticking with the traditional hit point system as a way of tracking wounds and health, Starfinder implements a combination system of stamina points and hit points. Hit Points (HP) serve as a measure of health. Reduction in those points represent physical wounds/damage, illness, or other serous physical impairment. Stamina Points (SP) measure your readiness and energy. They also replenish much faster than hit points. When you take damage from an attack, spell disease, etc. – it reduces your pool of SP first with any damage beyond that extending into your HP. You can of SP like your ability to shake off a hard impact. It’s fairly easy to get up after the first one or two, but eventually they add up and wear you down and start to seriously to hurt you. 2. Determination of tier and build points. 4. Selecting a power core. 6. Fill out remaining systems. If you don’t want to build a starship on your own or lack the time before running a game, several sample starships are provided. The Eoxian ship styles remind me of ships the Chaos faction in Warhammer Gothic. My personal favorite is the Vindicas Tyrant from the Veskarium ship styles. Granted, it’s a tier 16 Colossal dreadnought, but man, can she shell out the damage. Starship combat takes a bit of getting used to but gets everyone involved which is good. Combat is dependent upon the role that each of the PCs assume when they board ship. These roles determine when the PCs act in combat. Players choose from Captain, Engineer, Gunner, Pilot, and Science Officer. Starship combat is typically represented on a hex grid with some object used to signify the ship (miniature, pawn, coin, candy, etc.). Each ship occupies 1 hex unless otherwise specified. Combat occurs overs a series of rounds until it reaches conclusion. Each round is divided into 3 phases, resolved in order. Each character aboard a starship typically acts in only one of these phases, dependent upon his role. 1. Engineering – engineers each take an action to repair ship systems or to give them a boost. 2. Helm – each pilot attempts a Piloting check to move the ship. This is repeated each round the Helm phase. Also, during this phase science officers can scan for other vessels or target foes. 3. Gunnery – fire all weapons. If combat is not resolved, a new round begins, and everything goes back to step 1. A Captain mact during any phase of combat. His options, however, depend on his character level. He may Demand, Encourage, Taunt, Order (6th level), or give a Moving Speech (12th level). Starfinder contains a chapter on Game Mastering. If you are strictly a player, you can skip or skim the chapter. However, if you plan on running a Starfinder game, I suggest you read it. If you don’t have a lot of experience being a GM, you had better set aside some time to study this chapter! I’ve been a GM for over 30 years and even I found nuggets of good information here. Now, let’s talk about the actual setting. In Starfinder, characters adventure among the Pact World, a densely inhabited solar system. One of the great mysteries is that all historical records go back a few centuries and then go blank or end. Or become completely contradictory. There is a period of time referred to as the Gap where history is just missing. It was during this time that the planet of Golarion simply vanished. No one knows why. In its place lies a vast space station known as Absalom Station. The Drift is a hyperspace dimension reachable only via technology and allowing faster travel between stars. One of the problems with how Drift engines work, though, is they bring a chunk of a random plane into the Drift each time a jump is made. The longer the jump, the larger the piece of planar material that gets dragged in and left floating endlessly in the Drift. Sometimes this chunk appears right next to the ship which, if it happens to be a rock from Hell filled with devils, could be big trouble. So remember what I said in the beginning of this review about not using Pathfinder races in Starfinder? Well, I kind of lied. 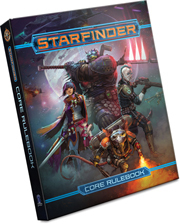 The final chapter contains information on how to convert Pathfinder to Starfinder. Paizo warns you up front that such conversions can require a lot of work, but they do give you some tools to work with. Overall, Starfinder is a very interesting beast of an RPG. While not true hard science fiction like Traveller, it’s not fantasy in space like Spelljammer either. It represents a good blend of both – mostly sci-fi with a touch of fantasy sprinkled in. If you are familiar with how the mechanics of 3rd edition D&D or Pathfinder works, then Starfinder will be a no brainer. If you are coming from a different gaming system, you will find it an easy learning curve. It’s a good game. Now available for preorder! Cover image and description are not final and may vary before release! Is this covered under the existing pathfinder subscription? Or will there be a new subscription for this? If a new subscription, can you preorder/subscribe at the same time? 32 people marked this as a favorite. We are still in discussions about how Starfinder subscription(s) might operate. As soon as we are ready to discuss subscriptions, I am sure we will broadcast it loudly from the rooftops. In the meantime, if you want a copy of Starfinder books, I would say to go ahead and preorder them. In the next few months before the launch at Gen Con, if there is a subscription that you wish to sign up for, the process to switch from preorder copy to subscription copy will be made as easy and painless as possible for you. How easy will it be to make a Deus Ex style cyborg? My excitement levels are off the charts! Is that a kasatha iconic? Same! Now would it be Engineering, Computers, or some other skill to calculate those levels? Will the ships featured in the game encompass everything from starfighters to capital ships? If we preorder, can we get the PDF version with it too? Charismatic Envoy? Is there a diplomat class?! I find that crazy exciting! It looks like it may be the iconic solarian as seen in the Starfinder Core Pawn Collection, which appears to have the solarian classes manifested energy weapon. I dunno about "featured"... but we certainly plan for those all to be options. Will there be a preorder for the PDF-only version? so...no big red space dragon on the cover. But also want to pick it up at GenCon--it's one of the main things I am looking forward to this year. Woot! I wondered when I saw a sub folder for general discussion in the forums if something was dropping soon. So excited. Anyway. Yeah. Here's my credit card and my first born son. No. The only digital products we offer for preorder at this time are through paizo.com are the Pathfinder Legends Digital and Pathfinder Roleplaying Guild Society Scenario subscriptions. I wondered when I saw a sub folder for general discussion in the forums if something was dropping soon. I am also interested on how the subscriptions will be done. Preordering for now, but hope there will be a subscription available. Definitely hyped. Enthusiastically waves towel over head. I anticipate a high volume of 3pp to account for the fact that there will be less Starfinder content released over time compared to Pathfinder (with just an AP line instead of AP, setting, and player companions). Plus, there are many, many writers out there who would love to take a crack at writing sci-fi content for Starfinder. What's the word on subscriptions? Just scroll up a bit. I encourage you to consider a Starfinder subscription that includes most, or all, Starfinder products. Last I heard the product releases were not going to be as rigorous as Pathfinder. Those of us who want to Subscribe probably want to collect all the things! Will there *be* a PDF version? Pffff! PDF? In the future, APs will be downloaded directly into your prefrontal cortex. This didn't build any hype. Nothing new was revealed. I was hoping for a new race. They've mentioned already known races that will become playable races. I'm excited for the Contemplatives. Are contemplatives a new races? I only know about humans, kashata, androids and ratfolk. They're listed as appearing in Starfinder First Contact as a playable race. Sooo that's a no then? How about a Pocket Edition of this? Way to early and financially suicidal. The development and art costs have to be paid for first. I usually prefer PDFs but I am mega hyped. I for one welcome our technomagical overlords...I'd like to remind them as a committed PFS gamer, I can help them gather others to enslave in their organized play sugar mines. I have pre-ordered everything Starfinder except the pawns (I'm holding out for Starfinder miniatures). Once the Starfinder subscription is available I will definitely switch to that, but for now I thought I would show my support for Starfinder, and appreciation and faith in the design team, by throwing some money at it. Along with the Subscriptions has there been any talk about a Starfinder Advantage attached to subscriptions? And also if you have it and the Pathfinder Advantage, while they probably wouldn't outright stack, would get an increased discount? Yeah after reading it again, there is no new info revealed.